Shawn Barnes is Williams-Keepers LLC’s director of business development and recruiting. He has more than 20 years of professional experience in news media, higher education, state government and professional services. He joined the firm in February 2002. He works with WK’s members and associates to develop innovative business development strategies designed to reach existing and prospective clients in the following industries: agribusiness; family business/closely held business; financial institutions; governments; healthcare; higher education; insurance; not-for-profit; and real estate and construction. In conjunction with department leaders, Shawn creates and manages recruiting and hiring plans for new members of the firm’s professional and administrative support staffs. 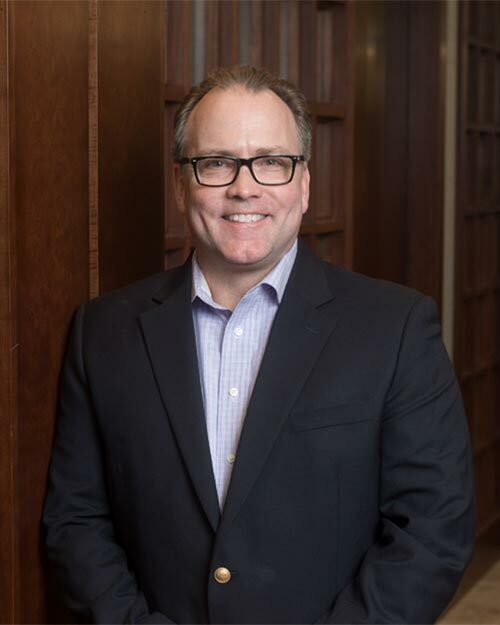 He also represents the firm in recruiting events and related activities with local colleges and universities and is a member of the University of Missouri’s Business Career Services Advisory Board. Shawn earned a bachelor’s degree in journalism and master’s of education from the University of Missouri. He is a graduate of the Columbia Chamber of Commerce’s 2006 Leadership Columbia program and also served as the program’s co-chair in 2010. He is a past co-chair of the Chamber’s Small Business Committee. Shawn was named to the Columbia Business Times’ 2007 20 under 40 list, which recognizes outstanding business leaders under the age of 40 in the Columbia community. Shawn served for seven years as a member of the Business Development and Marketing Committee for Allinial Global, an association of legally independent public accounting and consulting firms. Shawn is an active member of the community. In addition to being a member of the Columbia Chamber of Commerce, he recently completed terms as President of the Board of Directors of the Voluntary Action Center and Columbia Metro Rotary and is Past President of both organizations.